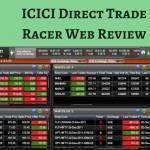 ICICI Direct Trade Racer Web is a browser-based trading application from the house of the bank-based stockbroker – ICICI Direct. 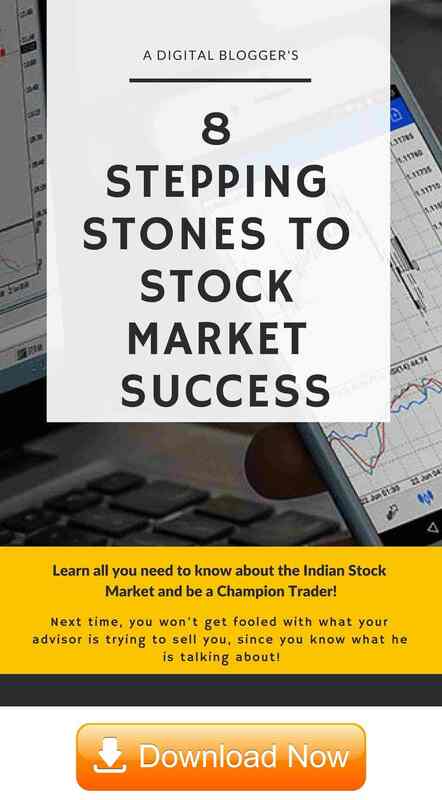 The broker provides you other trading applications such as ICICI Direct Trade Racer and ICICI Direct Mobile app as well where the former is much more promising than the latter, but still for people looking to use a web-based solution, here is an option for you. The good part of web trading applications is that you can use those pretty much from any device i.e. be it a laptop, computer, mobile, desktop or tablet. Since ICICI Direct Trade Racer web is responsive in nature, the application moulds itself to any screen size and device configuration. You just need to use a compatible browser and a web connection to access this application. One major requirement of ICICI Direct Trade Racer web is that you need to have SilverLight plugin installed onto your browser. If that is not that case, you will simply not be able to access this application. Having said that, installing SilverLight is pretty easy and can be done by following few steps. In order to log in to the application, you just need to provide your username, password along with registered DOB (Date of birth) or PAN card. Once you have provided these details, you will be taken to the main dashboard of this web application. Moving ahead, let’s talk about some of the features in this application. The below screen displays the home screen which can be personalized as per your preferences. 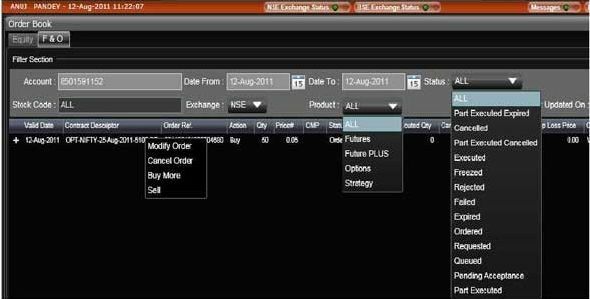 You can add specific widgets such as setting watchlists, portfolio holdings display, fund transfer widget and more. Furthermore, you are allowed to drag and drop different widgets (maximum 9) as well at any point in time. You can place different types of orders such as Market order, Limit order, After Market Order (AMO), Normal order and so on while trading across multiple segments such as Equity, Futures, Options, Currency. You also need to consider that Commodity trading is NOT allowed while trading through ICICI Direct. Order Book feature displays the complete list of orders placed till that particular point in time with provision to modify the orders. You can sort and filter different orders with respect to segment, order status, time range and more along with modifying or cancelling an order from the list. Access to live streaming quotes with minimal delay in the market feed. You can add multiple watchlists (5 in total) with respect to different indices, stock preferences, industries, themes and so on. Each watchlist can accommodate up to 20 scrips for your monitoring. 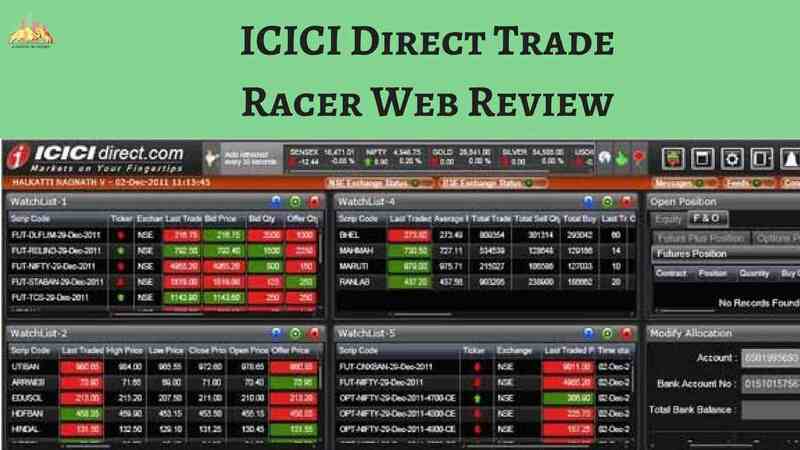 Since ICICI Direct is a full-service stockbroker, you get access to research reports and tips at both fundamental and technical levels within this ICICI Direct Trade Racer web application. Personalization in terms of themes, widgets, alerts and notifications is allowed. ICICI Direct Trade Racer Web is a responsive application that allows you to access this from any device through any compatible browser such as IE6, Chrome, Safari etc. The application is pretty lightweight in nature and does not require high configuration from your device. The application allows customization and personalization at different levels where you can just drag and drop different widgets on the dashboard along with setting specific alerts and notifications. 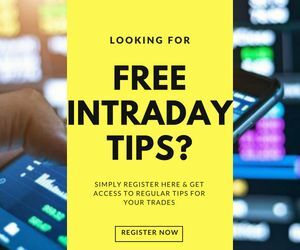 If you want to perform technical or fundamental analysis using this application, then yes, it gives you a decent experience but if you an expert level trader then you might hit a wall very soon. The overall user experience of the application is a tad complicated, especially for users at a beginner level who can find it relatively overwhelming. 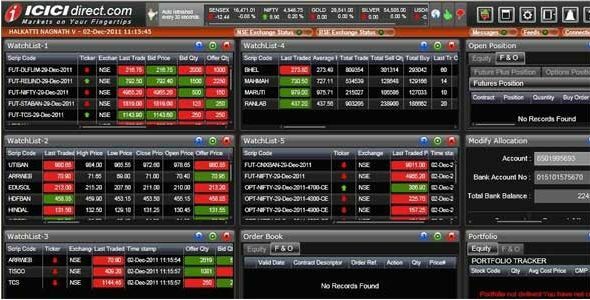 This web-trading application from this full-service broker offers limited value to an expert-level trader. In this competitive trading space, ICICI Direct certainly needs to pull up its socks and look to provide much better focus to its clients through its trading applications. Although the terminal software is a reasonable offering, neither the ICICI Direct trade racer web nor ICICI Direct mobile app have been able to convince their respective client base.